Since Ankara is in the centre of Asia Minor, the nearest beach is hundreds of kilometers away. Especially during summers, city residents spend their weekends at the pools to get relaxed after a hot, tiring day of the capital.Pools are an excellent venue for socializing and networking. The 600 sq. meter pool area is in Çayyolu and guarantees a joyous day with water quoits, contests, restaurants, cafes and a picnic area. The pool is open every day from 9 am to 6 pm and has an admission on weekends which is more expensive than the weekdays. Apple Garden provides free transportation in front of Ümitköy Galeria and you can return with the same service that leaves at 4pm. This center is in Ümitköy and offers various sport facilities and besides an aqua park. The pool is open from 9 pm to 7 pm, admission to the pool is more expensive on weekends. This covered Olympic pool is on Çubuk-Karagöl highway, 30 km away from the center of the city. The water is provided from a thermal spring. It is open throughout the year with a garden that offers sports and entertainment facilities. The admission is more expensive on the weekend. Sege is located in Kazan, on the 45th km. of Istanbul highway. It offers every facility of a holiday village, except staying overnight. The fixed price includes lunch and it is very reasonable. It is open everyday from 10 am to 6 pm. There is a 5-star Hotel pool that is open everyday from 6 am to 9.30 pm. Admission on weekends is more expensive. Among other facilities are the steam bath, sauna, and jacuzzi. Spormed is located in Ankara Ticaret Odası (Ankara Chamber of Trade) complex in Söğütözü. The side has a semi-Olympic covered swimming pool, steam bath and sauna. The grass-covered terrace for sunbath is called Hammock Beach. Membership is required for the facilities. This Sports complex is located in Bilkent and provides both indoor and outdoor swimming pool. However mmebership is necessary. It is open everyday from 7 am to 10 pm. 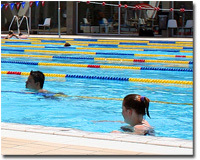 Membership is necessary to enjoy the outdoor and indoor swimming pools of this sports club. It is located in Çankaya, Yıldız district and is open everyday from 7 am to 10 pm.